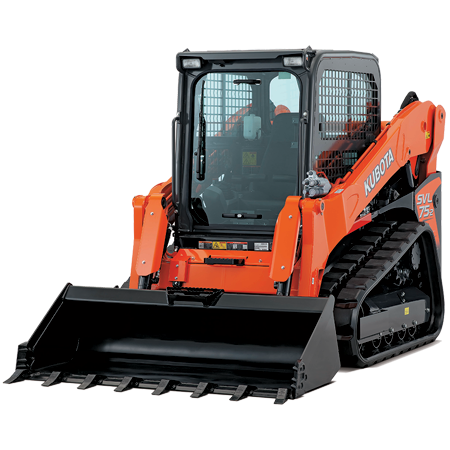 Powered by a 74.3HP Kubota engine, boasting exceptional 2814KG bucket breakout force and outstanding lifting capacity at 2214KG, the Kubota SVL75-2 takes high performance and productivity to a new level. 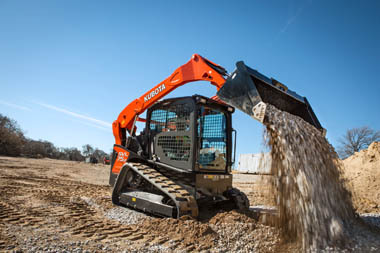 The new high flow model has increased hydraulic flow for the ability to operate a variety of attachments that require more hydraulic horsepower, with the versatility to meet your every need. 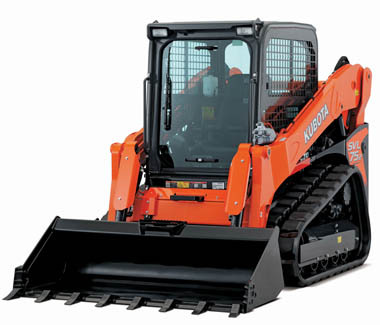 Best in class Kubota 74.3HP engine, renowned worldwide for exceptional performance and reliability. Standard with engine stall guard ensuring machine will not stall even in the toughest conditions. Wide working range and unique vertical lift design delivers exceptionally long reach of 1060mm. Self-leveling function keeps the bucket or forks in a horizontal position without having to manually adjust the angle while lifting the arm. Standard 2 speed function to shift from 7.5 km/h to 11.5 km/h witha press of a button. Pilot valve with shuttle piston ensures that consistent oil flow is delivered, improving stability when traveling straight. Ground clearance of 296mm let’s you drive over troublesome obstacles with ease. 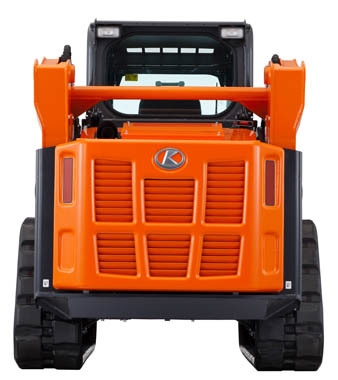 Traction force of 4390KG, the original Kubota lug design provides more grip and traction force than ever before. The Luxurious cab delivers all you need for a comfortable ride: wide cab entrance, ergonomically designed controls and deluxe suspension seat. Hand and foot throttle allows you to match the engine speed to the task at hand. 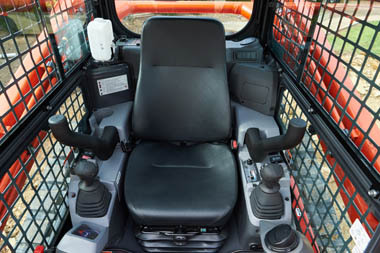 Pressurised cab keeps out debris with air conditioning for operator comfort in hot conditions. Standard on all enclosed cab models. Tilt up cab ensures easy access to hydraulic pumps, valves, lines and hydraulic tank for operator convenience. Slide and tilt radiator and oil cooler for easy cleaning and daily routine inspections. 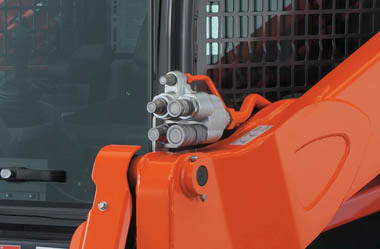 For daily inspection checks simply open the rear bonnet where components are centralised for operator convenience. Welded and integrated mainframe and undercarriage for maximum durability in the toughest conditions. Triple flange track roller design improves machine stability and minimises the risk of detracking. 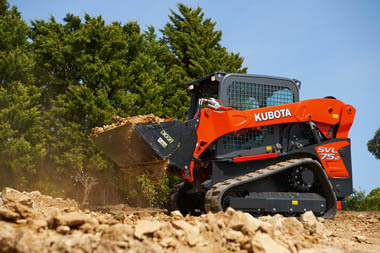 Kubota tracks prevent soil accumulation and increase tractor force during long hours of operation. Enhanced AUX flow rate on high flow model increased to (110.9 l/m) to run high capacity for attachments that require a large flow rate. Available in 1/2″ and 3/4 ” couplers. Electronic travel torque management system lets you work faster with more power. The ECU provides optimal torque by controlling the amount of oil from the HST pump based on the engine load. 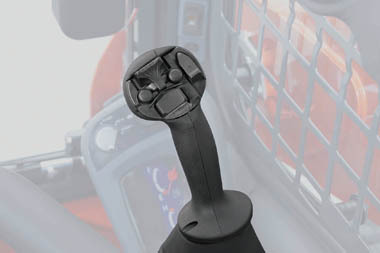 The new optional multi-function levers (STD on High Flow model) provide fingertip control of all major vehicle and attachment operations, letting you keep both hands on the levers at all times for optimal operating efficiency. Powerful Kubota 74.3HP Tier4 engine with CRS (Common Rail System) and DPF (Diesel Particulate Filter). CRS electronically controls the fuel injection timing and amount for high torque at a low RPM, improving work efficiency. DPF (diesel particulate filter) automatically burns the particulate matter built up in the filter. Automatic burning can be postponed when the loader is operating in fire prone areas or hazardous environments.